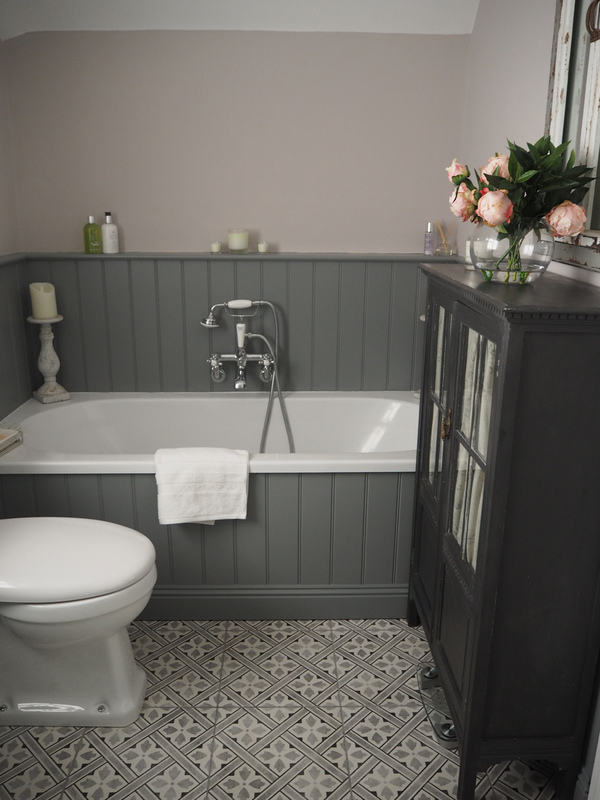 So this is a Bathroom Makeover Post, all about updating the very tired and dreary bathroom that we installed ten years ago, after a year long house renovation at a time when we had no money, no energy and no inspiration left! Thanks to a fabulous day out at the LA SS17 Press Day, inspiration struck & I finally found my bathroom mojo! You see, Laura Ashley had laid on icecream for their visitors, and in the rush to grab some (v. unlady like, but it was salted caramel! I mean!) I fell over the tile samples! And while I was picking myself up, I realised I was eye level with Mr Jones. And he cast his spell on me! It was love at first sight. 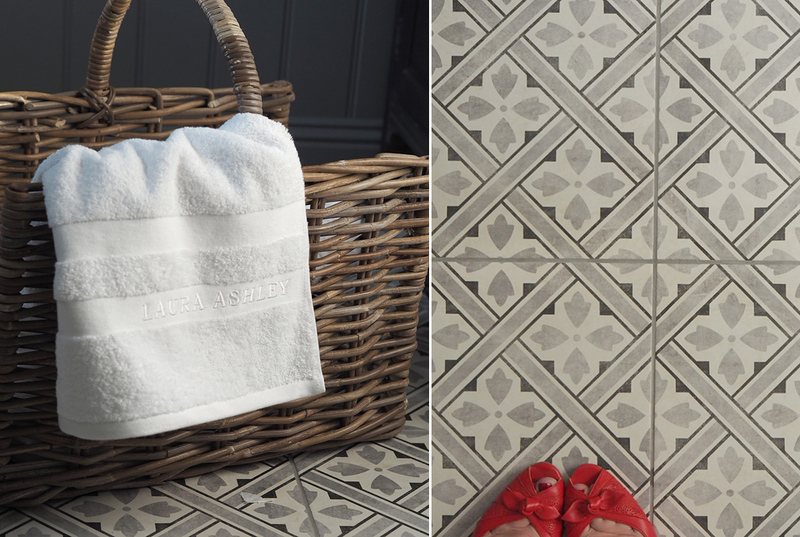 The tiles are British made, as you would expect from a brand such as Laura Ashley and are absolutely beautiful. 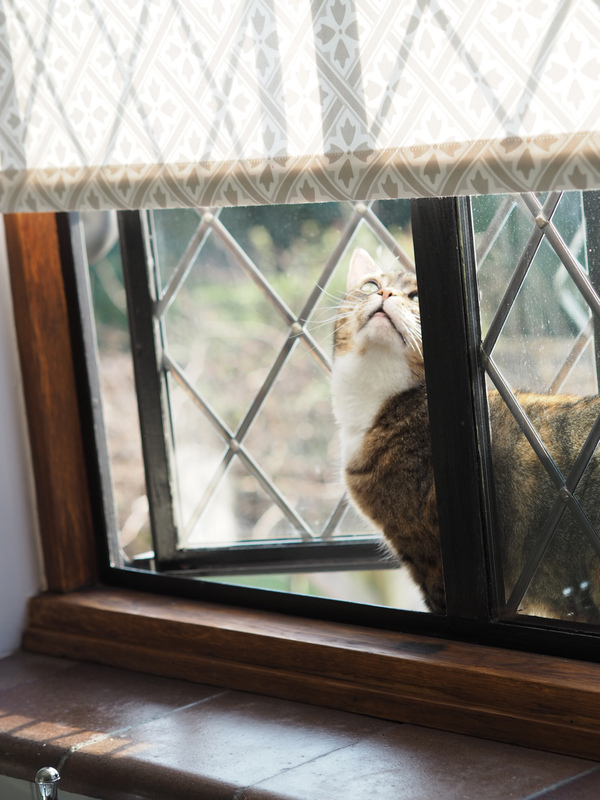 I decided to match the window treatment, to the floor, as the floor is so busy and I didn’t fancy a plain blind, and I thought that using another pattern might jar. 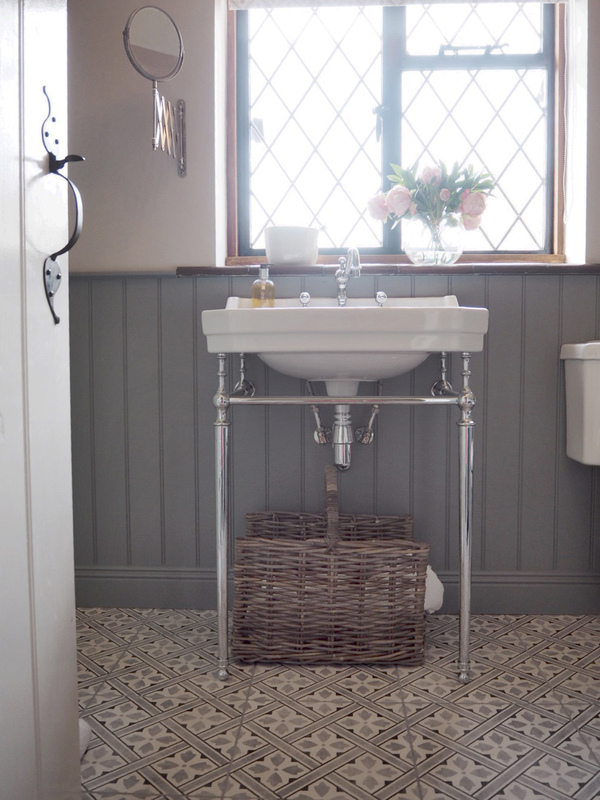 We ordered a made to measure Laura Ashley roller blind in here, as we have sloping ceilings, and it’s impossible to have curtains – but in a bathroom, I think a roller blind is quite a good idea. The blind is a paler and warmer grey, than the floor, so it’s not too contrived. Beryl, our cat, agrees. 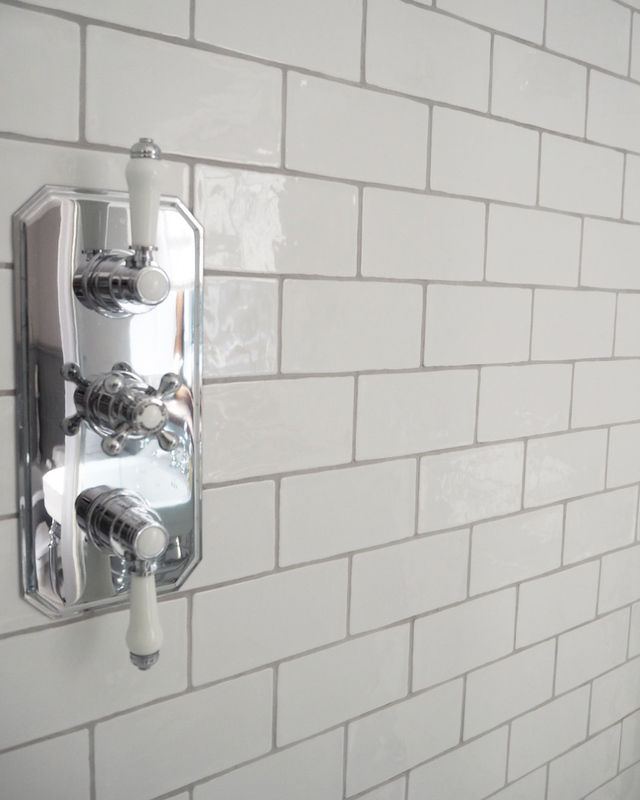 Accessorising our posh new bathroom was the fun bit! I am a serial faffer – I can faff for England. 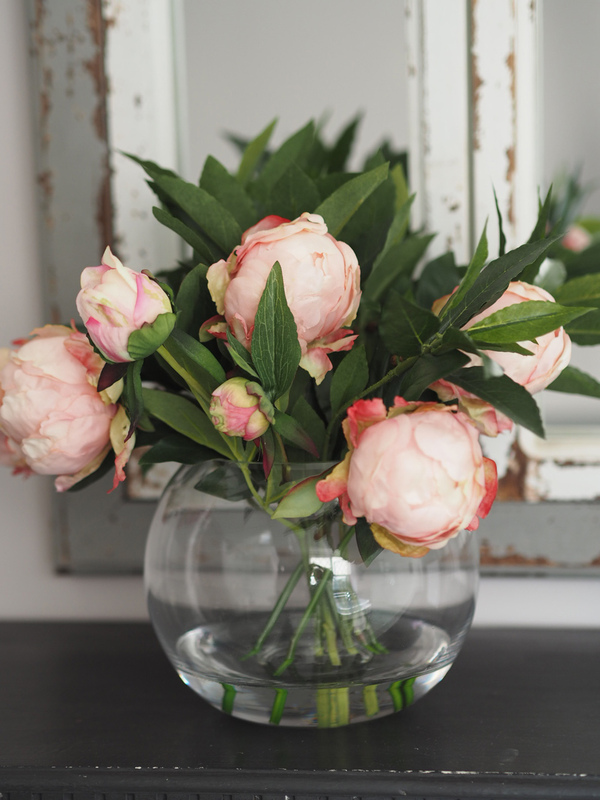 I love love love peonies and spend a fortune on them, every year, so when I spotted these peonies in a goldfish bowl style glass, vase, I was on it – quicker than a rat up a drain pipe! They look so real, they even fooled my Mum, who has radar for a faux fleur. 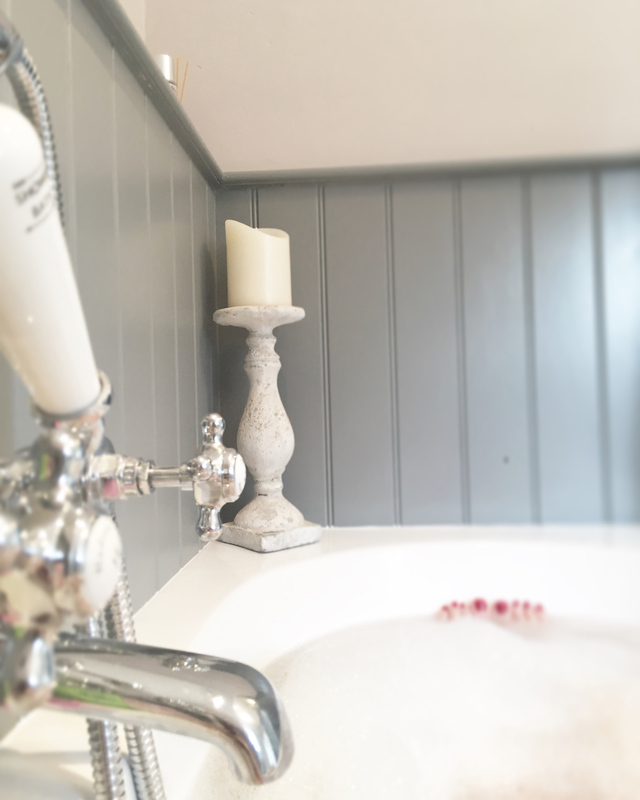 I love having candles in the bathroom, so I thought I’d try the mini diffuser set – which comes with a room spray, two mini candles and a mini diffuser – the bathroom smells delicious! 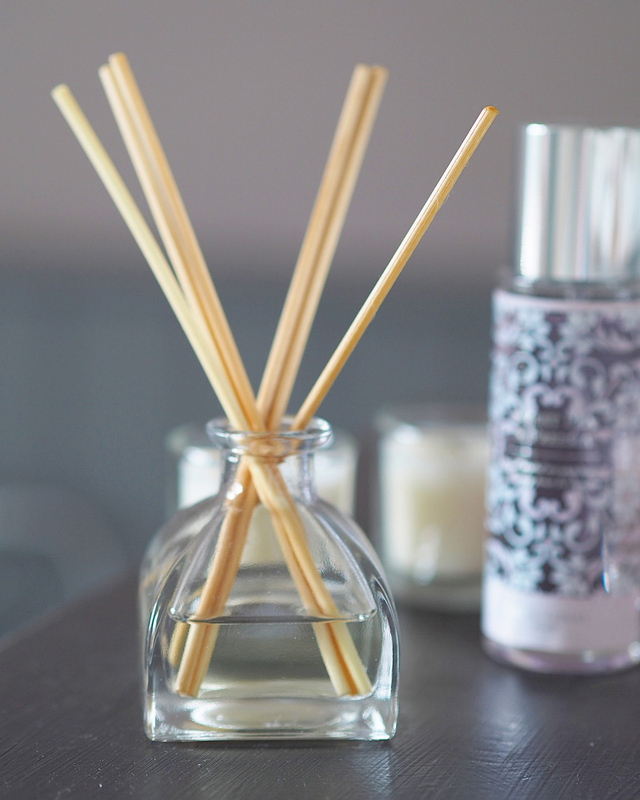 I’ve never used a diffuser set before – I thought sticks in a pot was a bit odd – how wrong was I! It smells amazing would make a lovely gift. We have a large collection – actually, we have a large, random assortment of terrible towels haha! Some circa 1995 from when we got married! And some in various shades from purple, to graphite grey. With 3 boys, I thought a coloured towel would be a good idea! Whaaaat a mistake-a-ta-make-a! They just end up splodged with mysterious bleach stains and look awful. (Where do those bleach marks come from?) SO on reflection, I think you can’t go wrong with white towels. 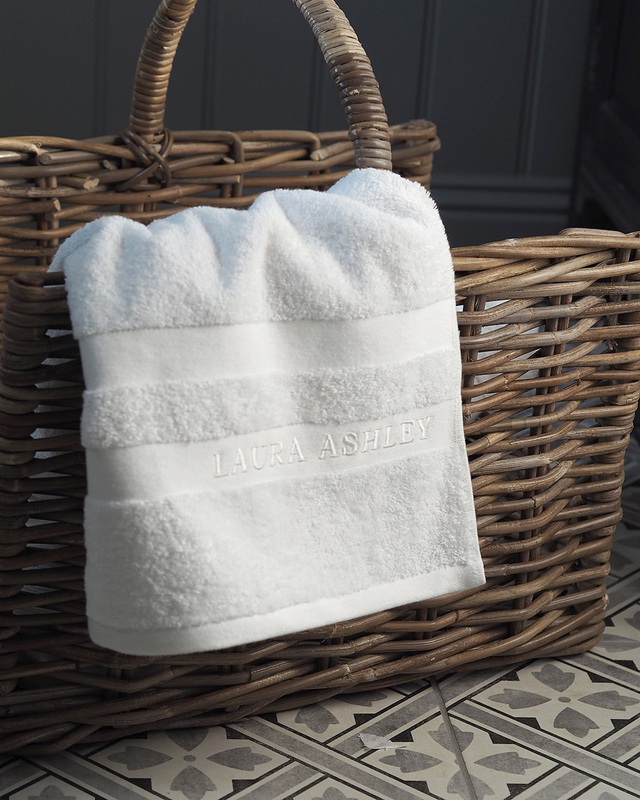 Fluffy white towels – gorgeous! I love the LA branded towels. They are super soft and fluffy. I even let the others use them, as they wash so well! 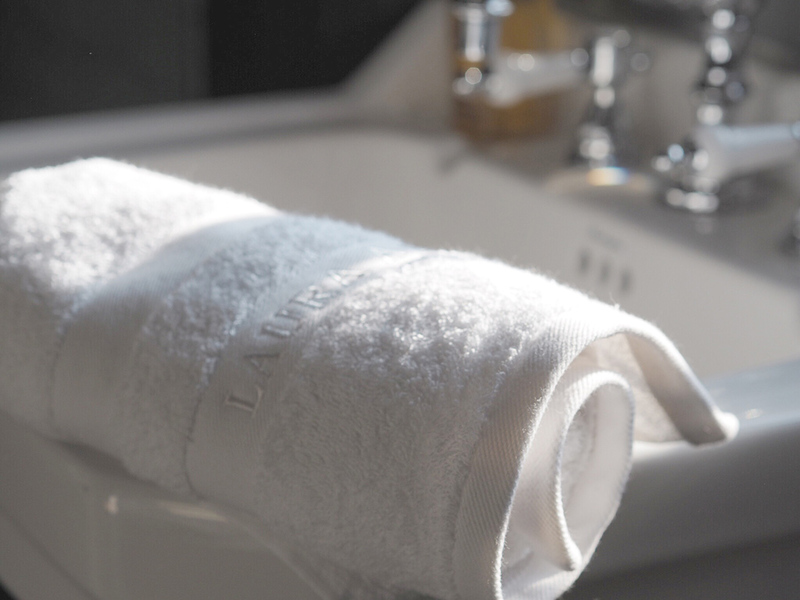 I thought I’d think a bit outside the box, for towel storage – having a couple of spare towels in the bathroom, along with some loo rolls, easily accessible – got me to pondering. I spent ages flicking through the catalogue, and had a moment of genius! (Genius and madness are not far apart, are they, so bear with!) I decided that a log basket would be PERFECT! (duh, obvs!) I love that the sides are high – hiding what is inside – but the ends are open! And it fits perfectly under the basin. So, there we are! Our poor old bathroom is now a gorgeous space, that I love being in. Tempted to move in with a pillow and duvet – it’s gone from being my least favourite space, to my fave room in the house! We are in love with Sally’s bathroom! 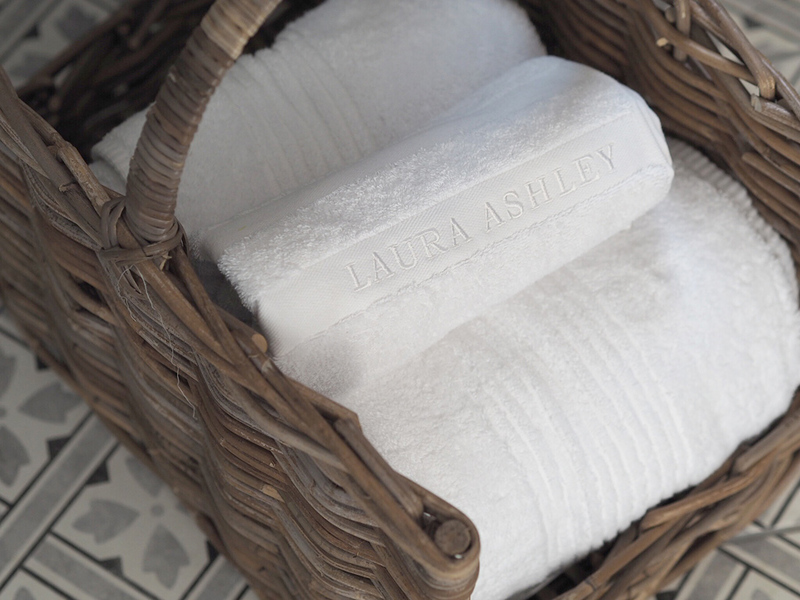 Make sure you check out the rest of the Laura Ashley tile collection. I have Mr Jones on my bathroom floor and every time I wash the floor, the pattern fades, help!! Should I deal the Mr Jones tiles as some of mine (just laid) are showing marks, help!!!!! Sorry to hear about that, are you happy for us to pass on your email so British Ceramic Tile can get in touch? I have Mr Jones tiles in my hallway and the colour is fading everytime it is cleaned. Suggestions please! Hi Debbie, sorry to hear this, would you be happy for us to pass on your details to British Ceramic Tile who will be able to help? Interested in these. Has the fading issue been resolves and addressed?